Turtle Holds on in Center of Vietnam's Capital A turtle weighing more than 400 pounds lives in a lake at the center of Vietnam's capital, Hanoi. The turtle, as legend has it, is several hundred years old and is the last of its kind. A turtle weighing more than 400 pounds lives in a lake at the center of Vietnam's capital, Hanoi. The turtle, as legend has it, is several hundred years old and is the last of its kind. MICHAEL SULLIVAN: Hanoi University biologist Ha Dinh Duc doesn't know if the sword is still there. But the turtle, he says is. 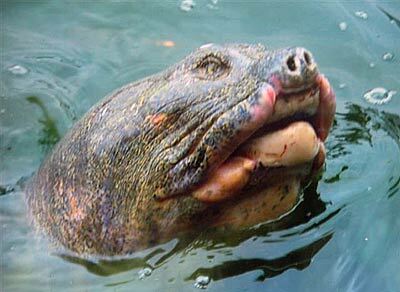 HA DINH DUC: (Through Translator) In general, the oldest turtles can get is about 300 years. But this turtle has something special that we cannot explain. I believe this is the turtle from the legend. SULLIVAN: Sixty-six year old Duc calls the turtle Great Grandfather. Locals call Duc Professor Turtle. He is now something of a celebrity here. The morning of our interview, Vietnam television is also at the lake to shoot a documentary about the professor and the turtle. DINH DUC: (Through Translator) I don't know why but when I first saw him in 1991, it left a deep impression. So I went back home and marked the day on my calendar. It seems there is an invisible bond between me and the turtle. At one time, there were four giant turtles living here. This is the only one left. SULLIVAN: Ha Dinh Duc is lobbying to have the giant of the lake recognized as a distinct species. The international turtle community is skeptical the turtle is the last of its kind, let alone the turtle from the legend. But almost everyone agrees the turtle is very old and very rare. SULLIVAN: At the temple, on the island, Vietnamese tourists pray and make offerings to the gods. And as they leave, some lean over the railing of the red wooden bridge to see if they, too, can catch a glimpse of the legend. A few say they believe the turtle in the lake really is the one. Others, like this young woman, Lan(ph), are less sure. LAN: Michael Sullivan, NPR News, Hanoi.